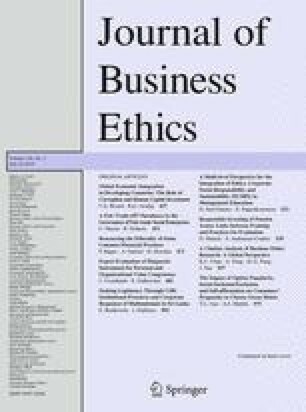 This study provides a global perspective on citations of articles published in ten business ethics journals between 1999 and 2012 and establishes three findings. First, the results indicate that Journal of Business Ethics and Business and Society are the two top business ethics journals based on the distribution of normalized citations received. Second, although North America, particularly the US, remains the top producer of business ethics research, it has been surpassed by Europe in terms of weighted normalized research citations received in 2012, implying a potential diminishing global role of US influence in business ethics research over time. Third, the top-ranked US institutions have reduced their business ethics research impact in recent years, while the European institutions have sharply increased theirs. We acknowledge the helpful comments from two anonymous reviewers. The usual caveats apply. Freeman, R. B. & Huang, W. (2014). Collaborating with people like me: Ethnic co-authorship within the US, NBER Working Paper 19905, http://www.nber.org/papers/w19905. Xu, N., Chan, K. C., & Chang, C.-H. (2015). A quality-based global assessment of financial research. Review of Quantitative Finance and Accounting. doi: 10.1007/s11156-014-0480-2.